Holidays in the Salzburger Land are always something special. Especially when Bad Hofgastein has been chosen as the destination. The charming village is a starting point for numerous activities - in the winter or the summer - and delights especially with its wonderful location. Against the backdrop of the Gastein mountain world and the national park Hohe Tauern, not far from Salzburg, the city of Mozart, and surrounded by the unique natural landscape of the Gastein Valley, you will spend especially relaxing holidays here. 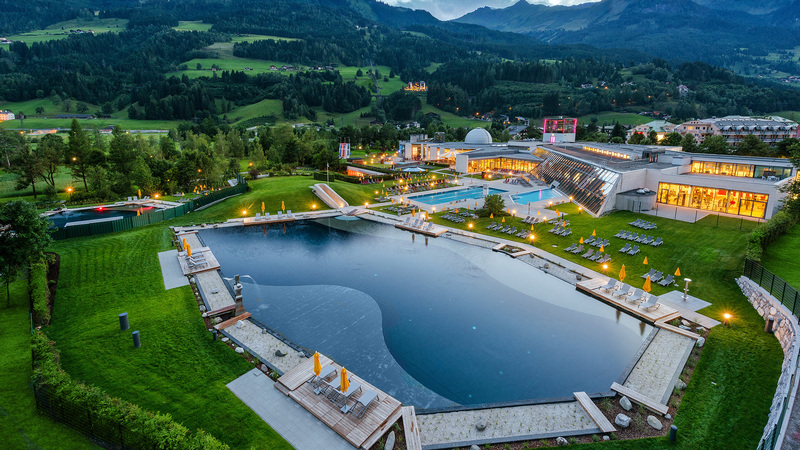 But what makes Bad Hofgastein distinctive is the Alpentherme Gastein with its thermal water containing radon and the healing adit which is known far beyond the country’s borders. The Alpentherme has conferred its name to the Thermenappartements in our apartment hotel. The connection is obvious - in the literal sense. For the Thermenappartements are not only connected with the thermal bath through their name, but also through a direct access. Book and enjoy your holidays - in the holiday apartments of the Thermenappartements! The family-run, top modern, spacious and comfortable Thermenappartments are located in our Kurparkhotel right in the middle of Bad Hofgastein. From here you are not only in the centre of the action with its seasonally changing activities and events. You will also have an underground access to the Alpentherme Gastein right in the neighbourhood. The Thermenappartements are a premium partner of the Alpentherme Gastein that is open unlimited to our guests and can comfortably be reached in your bathrobe. Moreover, the holiday apartments in the Thermenappartements are the perfect starting point for hiking, swimming and mountain biking or for winter sports. In addition, numerous excursion destinations in the surroundings will enrich your holidays. Rent your holiday home in the Thermenappartements at the heart of Bad Hofgastein in the Salzburger Land! In the new, top modern holiday apartments you will find enough space for the whole family. We look forward to your booking enquiry and will be happy to help you with further information. from € 188,- pro Pers.